Young casual woman using tablet and accounting colorful blooming flowers working in floral market outside. Young casual woman writing in file while talking phone and standing in floral shop near counter with flowers. 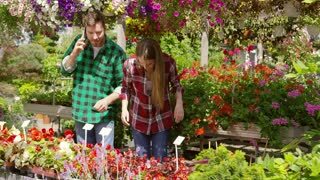 Relaxed woman spraying green blooming flowers working with man in beautiful summer floral market outside. Young girl using tablet and watching after man exploring beautiful blooming flowers while both working in summer floral market. 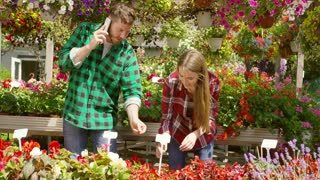 Cheerful man speaking on phone with client working with pretty girl in garden with blooming colorful flowers for local sale. 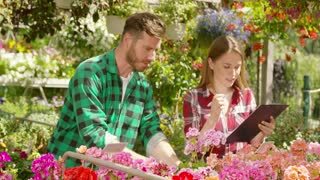 Young man and woman working together in outside floral fair taking notes and counting flowers for sale. 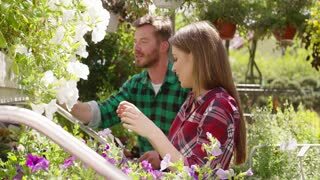 Side view of casual man and woman chatting while taking care of blooming flowers and working in garden. 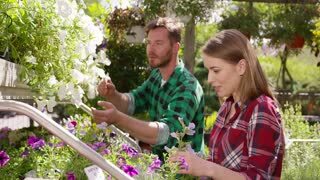 Side view of casual woman and man working in team and cultivating fresh flowers in summer blooming garden.